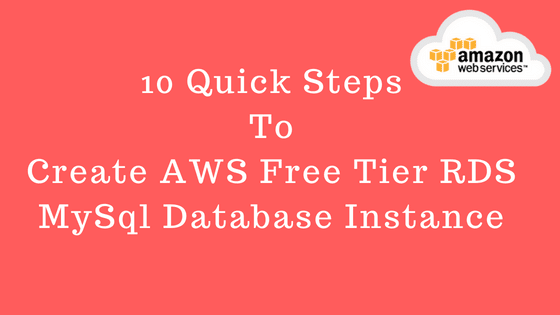 The Amazon Relational Database Service (Amazon RDS) Free Tier allows you to do some experiment with Amazon RDS for free. Please note AWS Free Tier is available to you for 12 months starting with the date on which you create your AWS account. 3: If required, You can change default region by clicking the region menu on upper-right corner. 4: On left side panel click on "Instances" menu, then click on "Launch DB Instance" button. 5: Now you must be on "Select Engine" page, The most important thing here is "Only enable options eligible for RDS Free Usage Tier" option you can see at bottom of this page. Click on that checkbox if not already selected, so that options that are not covered under the Free Tier will be inactive. Note: Please make sure, do not cross RDS Free Tier limit otherwise it will charge you accordingly in Free tier as well. 6: Choose "MySql" engine and click on "Select" button. Select "DB Instance Class" value "db.t2.micro--1vCPU,1GBi RAM"
Set Multi-AZ Deployment to "No"
Keep "Storage Type" and "Allocated Storage" as it is. Then under "Settings" section, enter values for a "DB Instance Identifier", "Master Username", "Master Password" and "Confirm Password"
8: On the "Configure Advanced" settings page, In "Network & Security" section keep default setting for all fields(VPC, Subnet,Publicly Accessible, Availability Zone & VPC Security Groups). 9: In "Database Options" section, enter your database name and "Enable IAM DB Authentication" to "Yes" (Optional) and keep default setting for other fields. 10: In "Backup" section, set "Backup Retention Period" to 0 (zero) days otherwise it will charge you. Next click on "Launch DB Instance" button and You are done!